At AP Autocare we have a car body shop which makes us on of the best car garages for dent removal and paint repairs in Bristol. We use the latest technology and latest techniques to ensure the best quality service is provided. Our staff have years of experience and ongoing training so you can trust that your car is in safe hands and will return to you looking good as new. To book or enquire about our car dent repair service in Bristol, please call 0117 963 8916. We can provide you with a free, no obligation quote. Car body work can often be damaged easier than we think. If your car is dented in an accident, then taking your car to a body shop is the easiest and often only way of having the damage fixed. If you have been in an accident, it is very important to find a car body shop that has your best interests in mind as it offers peace of mind at a very stressful time. You don’t want to visit a dodgy garage which may have more interest in your insurance company and only fix the surface problems. This means that your car will likely breakdown in the future and it can devalue your car if you want to sell. As with anything, it is good to do some research before you spend your money on a car respray or car body repair. Making sure the establishment you are visiting is of reputable background is very important, as you don’t want to be enquiring with a dodgy dealer that is going to take your money in return for a shoddy paint or repair job. AP Autocare is proud to be a part of the Good Garage Scheme, which is an award given to garages that continually uphold a high standard of customer service. Because of this, you know that AP Autocare is a trustworthy garage you can trust with car dent removal. This guarantees great value for money because you are going to get a professional job. Why You Should Have your Car Dent Repaired Bristol? Some people admit that they are happy to drive around in a car which has a few bumps and scratches. However, there are a number of reasons why you would want to get the dent in your car fixed as soon as possible. Luckily at AP Autocare we can repair your car dent quickly and at a reasonable price. Maybe the car is your pride and joy and you can't stand the unsightly dent so want it looking good as new. Or maybe your car is at the end of its lease so it would be better to get the damage fixed at a garage you can trust rather than risk being charged more than necessary. Another possibility is that someone else has caused the damage and it paying for it. Fixing the dent in your car can also increase its value if you are thinking of selling it soon. Whichever reason you are searching for car dent removal, you will want the job not efficiently. AP Autocare has an excellent car body shop which will be able to repair the dent in your car quickly and to a high quality. You will not regret choosing us as your car body shop garage in Bristol. We can fix small dents and large dents. 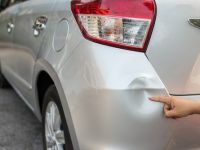 Minor dents include car dings and round dents that have been caused by the car being hit by small objects that have bent or torn the car metal. We have tools to do paintless repairs or we can respray your car if need be where the dent has caused damage to the paint work. Our car body shop can also repair scuffs and scratches which your car may have picked up. To get your car looking in its optimal condition, call AP Autocare today on 0117 963 8916 to book in your service.